Many of us would have seen the news on the new subsidised insurance which MINDEF is providing to all personnel including regulars, NSF and NSmen. This also extends to your spouse and children. You can read the news here. The purpose of this post is to uncover the protection provided and the premiums payable. From what I see so far, the coverage we get and the premiums payable is so much lesser than if we were to get from outside insurance agents. You'll be surprised it is about half the cost. This is one of the 30 recommendations by the Committee to Strengthen National Service (CSNS) to better recognise the contributions of national servicemen to national defence and security, and to strengthen our care for them. If you've served national service, this will be of interest to you. If not, if your spouse has served national service, you can also get the insurance through him or her. 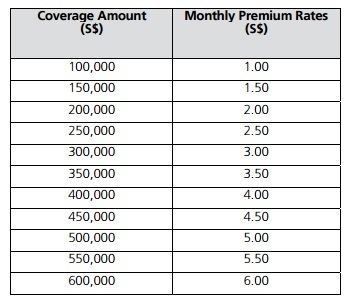 What is the MINDEF & MHA Group Insurance? Under the MINDEF & MHA Group Insurance, there is group term life and personal accident insurance. Even if we do not buy any insurance, from 1 July 2016, we will automatically be provided with $150,000 group term life and $150,000 group personal accident insurance coverage during the period of our full-time NS and operationally-ready NS (ORNS) duties. The premiums are fully paid by MINDEF and MHA. As we can see, for a coverage of 1 Million, the premiums is only $41 per month. This covers 1 Million in the event of death or Total Permanent Disability only. If we compare to a term life insurance in the market using compare first website, the lowest will be $71 per month. If we're thinking to just get insurance for death and total permanent disability, then it wouldn't be much of an issue. However, if we want to add in riders for critical illness, there are certain limitations for this scheme. 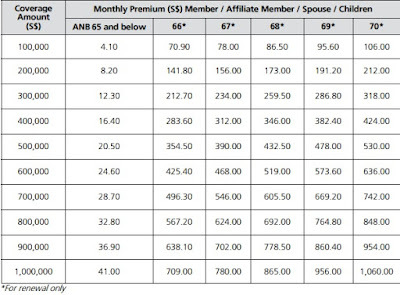 As we can see, the premiums are in age bracket and not flat rate. 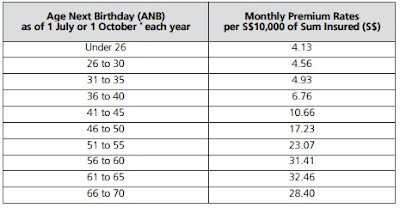 This means we have to pay more per month as we hit the next age bracket. 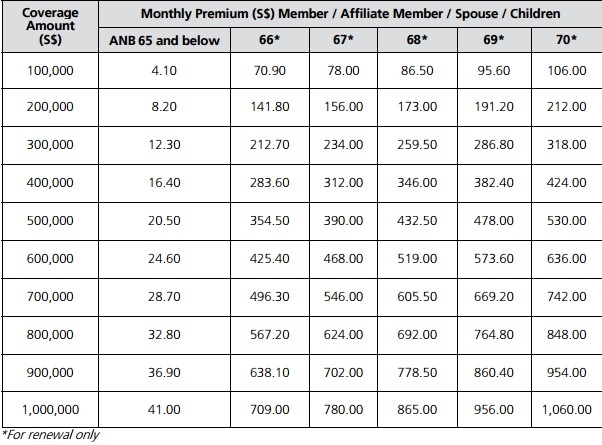 The problem is when we get pass 50 years old, the premiums can be quite a lot and even more when we are above age 60. If we are planning to add in this rider, there may be a problem in later parts of our life. There is also another optional rider called disability income. This coverage will replace your income in the event of disability. The annual coverage amount is based on 50% of your monthly basic salary multiplied by 12 times up to a maximum annual benefit of S$120,000. Similar to the living care rider, the disability income rider premiums are increasing. A point to note is the riders have to be bought together with the Group Term Life or Group Personal Accident insurance. We cannot buy the riders only without the main insurance. For the personal accident insurance, it provides coverage in the event of an accident. We can cover up to $600,000 at cheap premiums. 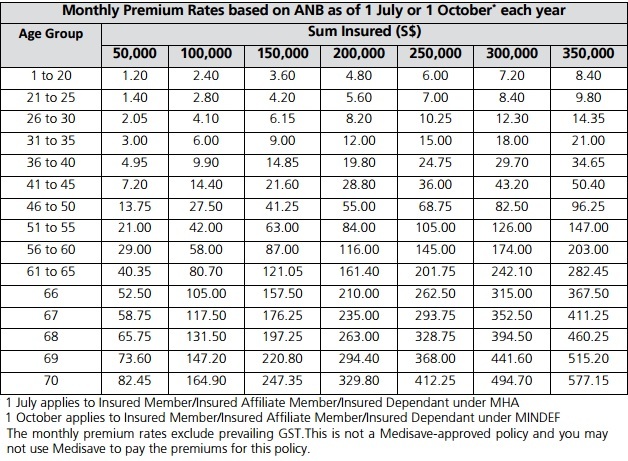 For personal accident, the premiums are on a flat rate and doesn't cost much. For the full list of items and conditions we can claim, you can refer to the brochure here. Lastly, I've complied the list of brochures from the website which I've wrote in this post. You can refer to the brochures for more information on the coverage and the premiums. I understand that to apply for the insurance, we cannot get through the public insurance agents channel and have to purchase direct from Aviva. For the full suite of insurance offered under the MINDEF & MHA Group Insurance, you can refer to the website here. The above products are more for MINDEF personnel. For MHA personnel, you can refer here. It is quite similar from what I see. I hope this post is useful for those who want to find out more on the new group insurance for people who served national service and played a part in contributing to national security. Don't forget this applies for your spouse and children as well so you can also buy for them through the voluntary scheme. The road to financial independence is sometimes not an easy one. Many people in the past such as my parents' generation born in 1950s-1960s were savers. They work hard, they save money and never really had much luxuries. Life was simple back then. However, you would have realised that the baby boomers generation still did not have much savings. This is after working hard and saving money all their lives. Why is this so? The reason is simple, most of them could not increase their income due to circumstances back then. Some of them had to quit school early to work in order to supplement income for the household. Singapore was also transforming fast during the 1980s and 1990s which means jobs were changing fast too. Some were left stranded with their skills and experience being made redundant and this caused them to suffer wage cuts or stay stagnant in their career. Income is an important factor on the road to financial independence. You can be saving 50% of your income but if you earn only $2000, that is just $1000 savings which is not a lot. Furthermore, if you want to start a family or have kids, it is quite hard to save if you have a low salary. I have been focusing on increasing my income which I see it necessary if I want to achieve financial independence earlier. It may take years and a lot of hard work to increase income but it will all be worth it in the end. If you're looking at a career switch or to upgrade your skills for more income, this is the post for you. If you hate your job, most likely you're not going to do well in it. Passion has created success for many people as they no longer feel a burden to work. People with passion tend to excel in their work and create more income for themselves be it in their career or business. The problem with finding a job you like is when we were younger, we may not have chosen the right course to study and thus not able to enter the industry we want. We may have spent $25,000 on a university education which we realise we didn't like at all. When we enter the industry we don't like, we may want to change. This is a programme where there are a series of seminars, conferences and mentorship sessions to help us up-skill and even gain access to useful networks. 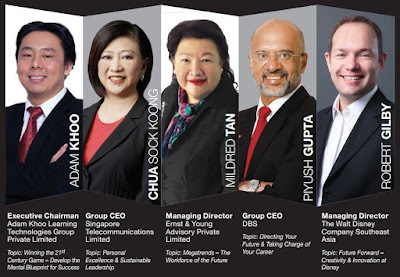 1) Future Leaders Summit - The flagship conference featuring speakers such as the CEO of DBS, Managing director of LinkedIn, vice president of amazon etc. 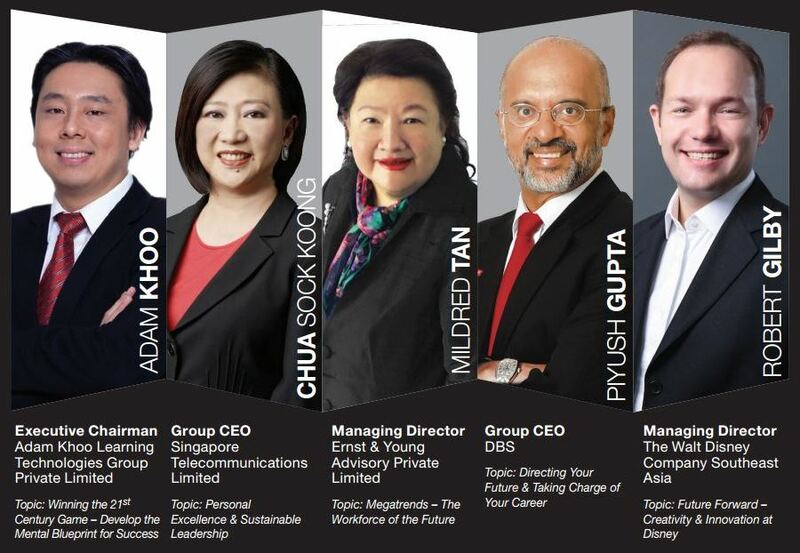 2) Future Leaders Mentorship - Where industry leaders conduct mentoring sessions in a small group setting behind closed doors to help PMEs in their personal and career development. 3) Future Leaders Sectorial Programmes and Series – These are sector specific such as young engineers leadership programme, aspiring HR leaders programme, finance operations development programme and many more. This to me is the best funding for courses I've ever seen. On top of the $500 SkillsFuture which we know of, there are actually a lot of courses which are heavily subsidised for Singaporeans and PR. Let's take for example you're seeking a career in project management, you would most probably need to be PMP certified which a lot of project management job position requires. PMP stands for project management professional. The PMP® designation is recognised worldwide as the standard of the profession. 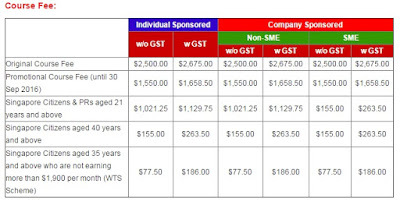 As you can see above, if you're a Singaporean or PR, the course fees reduces to $1129.75 as compared to the original course fees of $2675. 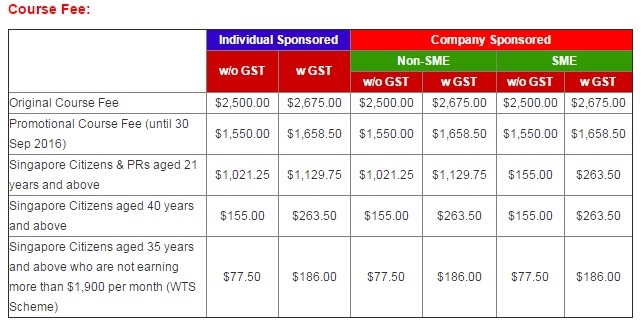 If you're age 35 and above, you get even more subsidies that the course fees comes down to just $100-$200+ dollars. Don't forget we still can use our $500 skillsfutures credit to offset the course fees so in the end we don't really have to pay much for the whole certification course. To remain relevant in the workplace, Singaporeans have always been encouraged to upskill. Labour chief Chan Chun Sing even said “As our economy transforms, more and more of our people will be in the PME sectors, and it is also NTUC's job to make sure that we help our PMEs remain competitive and stay ahead of the competition." Aside from the $500 SkillsFuture credit given to all Singaporeans which can be used on a range of 10,000 courses, there are actually so many schemes to subsidise course fees for us. Some of the schemes are workfare training support scheme and SkillsFuture Mid-Career Enhanced Subsidy. If you're an NTUC member, you can also get further funding under the Union Training Assistance Programme (UTAP). If you're interested in short courses such as communication skills or WSQ certified courses, I saw some by NTU which are quite interesting. Courses such as negotiation skills, or even WSQ Apply Statistics for Lean Six Sigma. More information on the short courses by NTU can be found here. There are also subsidies and SkillsFuture credit can be used. Lastly, I also noticed that there is this place and train programme under WDA where it enables companies to hire workers first, then to provide them with structured training to equip them with relevant skills and knowledge.Under the programme, the trainees do not pay any fees as their training will be supported and co-funded by their employers and WDA. These trainees will also receive their salaries as usual, as they are already employed once they join the programme. There is a whole list of conversion programme where we can switch our career to. We get employed and we get the training without any cost. 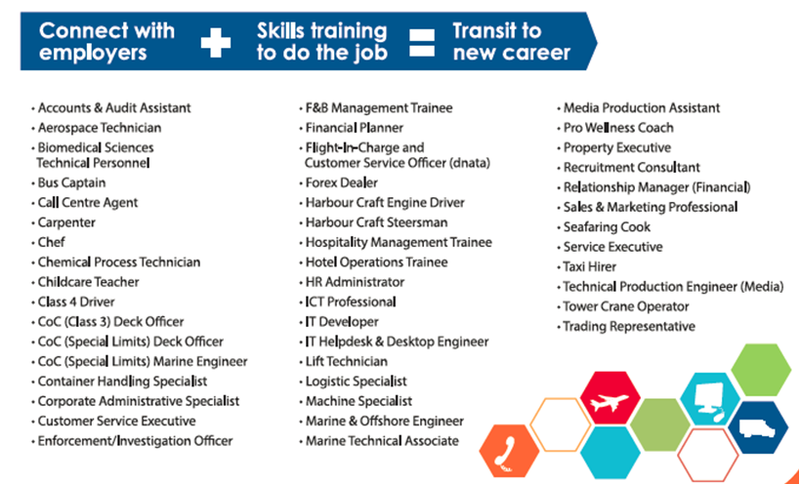 Since 2008, NTUC’s e2i has also worked with various industry partners to create over 50 Place-And-Train programmes. Getting relevant certification will help us to increase our income. The courses will also help us if we want to make a career switch into something we feel more passionate about. With the heavily subsidised courses, I think all of us can look to upgrade our skills and increase our income. 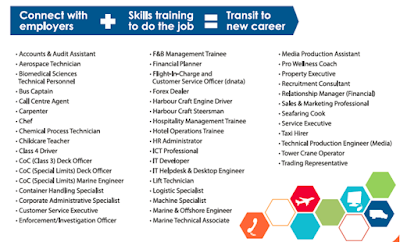 Also, with programmes such as the place and train programme, switching career is no longer just a dream. There are many ways to increase our income. By just knowing more about the schemes available, we can see a better light for our career and also able to seek a passion which we yearn for. Is Buying High Dividend Stocks A Wise Choice? I've been very busy the past few weeks and have not been blogging much on investments. My apologies to readers who want to read more on investments here. In the midst of investing for the past few years starting from 6 years ago, to be honest, it was not always a smooth sailing one. I have made mistakes, learnt from it and moved on. To date, I've come to realised my own investment style and manage my risk accordingly. There are stocks which has huge percentage loses in my portfolio but because they make up only 1-2% of my entire portfolio, the losses are really negligible in monetary terms. If I had invested heavily in those stocks, I would have lost a lot of money. Even after 6 years of investing, I'm still learning the ropes of it. Market has been relatively sideways with a few irritional downward spins which presents good opportunities. Buying high dividend stocks has been a favourite among Singaporeans. REITs are very popular here because of the higher dividend nature. But, is buying high dividend stocks a wise choice? In this post, I will back test a few high dividend stocks and see the returns we would have (inclusive of dividends) if we had invested at that time. 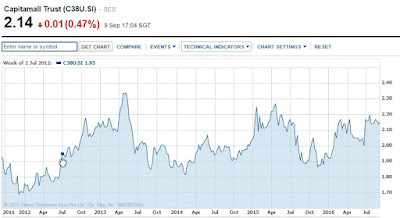 Capitaland Mall is a sideway stock where the price have not really increased for the past 5 years. Let's take for example if we had invested around the mid price of the chart in 2012 where the small hand is, the price bought would be 1.925. The price now is 2.14 so there is some capital gains but not much. It would just be 11.25% gain in 4 years. But, if we had added in the dividends received, the gains would increase to 34.54%. This shows that the dividend received makes a difference if we had bought this stock. Now, what if a stock price has dropped over the years but this is a high dividend stock? Would we still have profits? 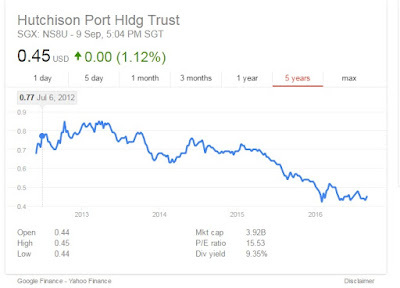 An example is Hutchison Port Holdings trust which was a high dividend stock many years ago. However, its stock price dropped by almost half in the past 4 years. Now, if we had bought in 2012 at around 0.75, would we still have profit today? The answer is no. At one point in time, this stock was giving as high as 10% dividend yield. If we had invested back in 2012, the losses would have been more than 40%. But, if we include dividends received, the losses would reduce to about 10%. This seems like dividends still do make a difference. Dividends can definitely get us more money in our investment portfolio but it would be pointless if the share price drops too much that the dividends collected don't even cover the losses due to drop in share price. The best combination would be the share price increases and we still get dividends. In such scenarios, we can expect the dividends to increase too if the company is making more money and wants to reward shareholders. Read: Buying the company on the streets (Part 2) - When to buy? A point to note is that there is no holy grail to investing. Over the years, I realised even if we follow another successful investor's style, we may still not be successful in investing. This is because no two investor will have the same capital or the same portfolio for investing. Everyone of us invest different amounts to each individual stock and also have different number of stocks in our portfolio. For example, investor A may invest $5000 in a stock and investor B also invest $5000 in the same stock. When the stock price drops by half, each of them looses $2500. However, the difference is investor A has a $100,000 stocks portfolio while investor B only has a $10,000 stocks portfolio. In this case, investor A looses only 2.5% while investor B looses 25%. I've also come to realise that risk management is very important in stocks investing. How I manage risk is simple, if I feel that a certain stock is my portfolio is risky, I will reduce my exposure in it. Risk can be in the form of declining profits, poor industry outlook, uncertainties and poor balance sheet. There is always an opportunity with under-performing stocks but my personal preference is not to have too much exposure in it. That's why some people say its a punt for speculative stocks which is risky by nature. For stable stocks and those with a strong balance sheet, I would increase my exposure in it. But, this is bearing in mind that I do not buy the stock at a high price base on the valuations. It is important to understand how to read financial statements and determine if the company is worth buying at that price. We can use ratios such as PE, PEG, Discounted cashflow/earnings, PB etc to determine valuations. This has to be reviewed periodically as things could worsen in the future. One stock which I've held on and increased my exposure to a large extend is Saizen Reit. This Reit has relatively good dividends at about 7% and stable growth. The rationale is simple, this is a REIT which owns and rents out residential properties in Japan, is undervalued and also Japan was starting to do a major QE at that time. Rental residential properties are in demand in Japan because of the high price of properties there. It is also much more stable as compared to retail or hospitality which can be affected by economic conditions easily. 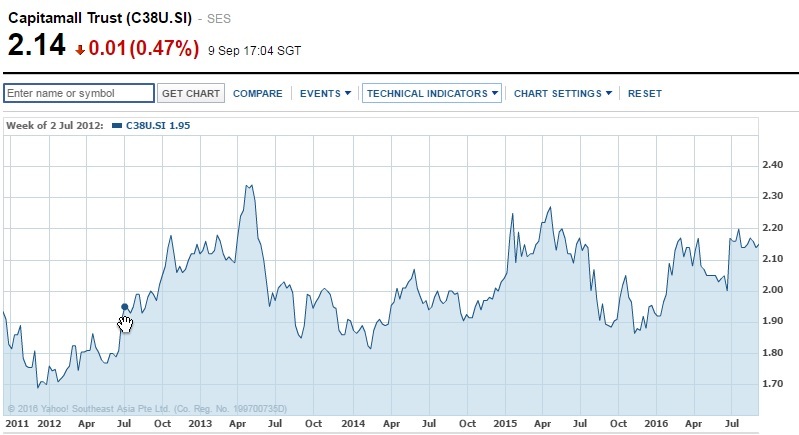 Saizen Reit has since been acquired and reverse take over by another company which sent the share price up. So Is Buying High Dividend Stocks A Wise Choice? Dividends can indeed boost the returns in our portfolio and also provides an additional source of income. It can be quite significant if we have a large investment capital to begin with. Some of my other blogger friends have more than 5 figures a year for dividends. But don't just focus on dividend yield alone. If the stock price drops too much, it is not a wise choice then. Learning to pick good dividend stocks is the key. Money may be a difficult topic to bring up with your significant other. 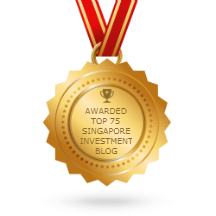 One of my blogger friend, Lionel from cheerfulegg, has written this guest post exclusively for SG Young Investment. Even I learnt a few tips here. He definitely has gone through this stage with his partner. Enjoy the read! Every Singaporean couple can easily tell whether they’re in a serious relationship: It depends on whether they’ve had The Talk. You know the one I’m talking about: The one when the guy takes the girl out to a fancy restaurant, takes her by the hand, stares deeply into her eyes, and asks: “Sooooo... Do you want to apply for BTO in Punggol or Sengkang?" Okayyyyy. Things are getting serious here. But what if, after having The Talk, you found out that your girlfriend wants a $110,000 wedding? Or what if your boyfriend insists that he wants a $1M condo - something you know that you can’t afford? Would you break up with him or her? Are you letting money come between you and your partner? Are you putting a price on love? Trying to clear the debts has put a strain on the marriage and their relationship, Mr Lee said. "I think we have had more fights since we got married than in the six years that we were dating." “Hey, so I was chatting with my colleague today who just bought a house in Tiong Bahru. Great neighbourhood, near the MRT, though slightly more expensive than he expected. That made me think about where WE might want to live in the future, if we get married. I was wondering whether you’ve thought about that before?" “Yes, I think this condo has a fantastic modern design too. In fact, I read this article on Qanvast about how even HDB owners are renovating their houses to make them look like condos on the inside. Do you think that’s something we could consider?" The goal is to simply understand your partner’s aspirations and to let him or her know about yours. The more details you have, the better. They’ll come in useful for the next step. How Much Is Needed To Get Married & Start A Family In Singapore? How Much Would It Cost To Travel The World? What Is The True Cost Of Owning A Car In Singapore? “Hey, so I was thinking about our conversation the other day and how we said we wanted a restaurant wedding. I did some calculations and found that it would cost us around $40,000. I’m not sure if I estimated it right, so I wanted to get your advice. What do you think?" “I know this is just an estimate, but it looks like a wedding with 400 guests might be more expensive than we thought. I know this is important to us, so maybe we can take some time to figure out how we can get there together?" Re-emphasize that you’re not doing this to criticise each other, but to help you both figure out how to achieve your aspirations together. The big day is here! Block off two hours on the weekend to do this, so that you’re both relaxed and unhurried. Agree to come prepared with your bank/insurance statements, and any other financial commitments you currently have. First, start off by recapping your aspirations. Then, go through your documents together to find out what your financial situation is as a couple. Is it really necessary to bring all these documents? It might seem like a hassle, but I’ve personally I found that it helps tremendously. First, it eliminates the guesswork. You don’t have to say things like “Yeahhh… I THINK I have around $20,000 in my savings account.” A quick glance at your bank statement will tell you exactly how much you have. More importantly, it sets the right tone for your relationship. When you “bare it all”, you’re showing each other that you want to be open and honest with each other - and that will translate into other parts of your relationship. What’s next? The easiest way to start is to set some short-term savings goals. For example, if you estimate that you’ll need $40,000 for your wedding in 2 years, that means you’ll need to save $1,667 per month, or around $833 each. If that sounds too high, make a commitment to put say, $300 each into a joint savings account every month, with the understanding that you’ll increase it later as your salary rises. (By the way, if you want a quick, easy way of saving more efficiently - I also wrote a mini ebook on how to automatically save more every month, without having to change your lifestyle. You can check it out here). That’s pretty much it! The goal here is to get your partner to take action - no matter how small - towards saving and investing for the future. The simple action of actually DOING something will make you both more mindful about money. Talking about money may seem like a lot of effort - but trust me, it’s worth it. This could be the person you spend the rest of your life with, so why not invest a few days to get it right? The key here is patience. Approach the topic slowly, listen to each other, and focus on your hopes and dreams. This will set the stage for more open conversations in the future. And when you finally pop the question - whether it’s “Will you marry me?” or “Sengkang, or Punggol?” - you’ll both know the answer in advance. ==== Lionel Yeo is a ramen-slurper, bathroom dancer and financial hacker behind cheerfulegg.com, a personal finance blog for young executives. He has been featured on the Sunday Times, Channel News Asia, KISS 92 and more. He also secretly dances in his room. Check out his free guide on How To Start Investing In 3 Days.